WHAT IS THE ENLIGHTEN 3 LASER AND WHY IS IT BETTER? Shore Vascular & Vein Center Blog WHAT IS THE ENLIGHTEN 3 LASER AND WHY IS IT BETTER? One of the first things that many individuals discover when exploring options to have their tattoo removed is that there are many different centers available to perform that treatment. One of the differences between many centers is the type of laser, or lasers, used to remove tattoos. Not all lasers are the same. Laser technology has advanced greatly in recent years. The type of laser used is very important in obtaining the best possible results. In understanding why certain lasers are better than others, one must first understand how lasers work to remove tattoos. Tattoo ink is designed to be permanent. The body views this ink as a foreign substance and tries to eliminate it. However, the ink is made of particles that are too big for the body to eliminate. 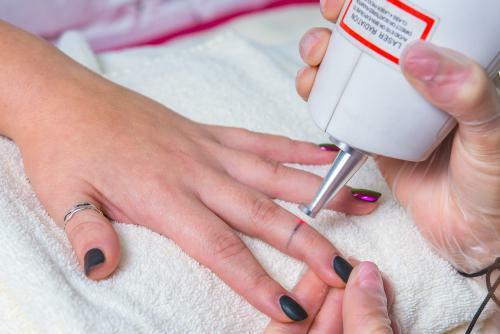 Laser works with the body’s own natural immune system to remove tattoos by breaking those ink particles into smaller ones that the immune system is able to handle. If you think of the ink particles as “rocks,” laser energy is delivered into those “rocks” in very fast pulsations, breaking the “rocks” into “pebbles.” Those smaller “pebbles can then begin to be eliminated by the body. The problem is that the smaller “pebbles” are often not small enough to be completely removed. That is where the new Enlighten 3 laser comes in. Enlighten 3 delivers its energy into the tattoo ink at the speed of a picosecond, or one trillionth of a second. That is 1000 times faster than the pulsations of older lasers, making it much more effective in removing the ink more completely. Instead of the energy breaking the “rocks” into “pebbles,” it pulverizes them into “sand.” That is why the Enlighten 3 pico laser is so effective in removing tattoos. The other important thing to understand is that different colored inks require different wavelengths of laser energy to remove them. The Enlighten 3 laser uses 3 distinct wavelengths of energy to treat tattoos of all colors. It is like having multiple different highly effective lasers contained in one very technically advanced machine. This allows for effective removal of nearly all tattoos. So, the type of laser used to treat your tattoo can make the difference between excellent and poor results. The Enlighten 3 laser uses the latest picosecond technology, combined with 3 unique wavelengths of laser energy to effectively treat most tattoos faster and more completely than with other lasers. At Shore Vascular & Vein Center / Aesthetic Laser Center, we use the Enlighten 3 picosecond laser for tattoo removal. All procedures are performed by Dr. Jeffrey Gosin, a double Board Certified Surgeon with extensive experience with laser procedures.